Dáil business is held up after independent TD John Halligan refuses to leave the chamber following a vote by fellow TDs. THE DÁIL has been suspended this afternoon following a row between the Ceann Comhairle, Seán Barrett, and Waterford independent TD John Halligan. 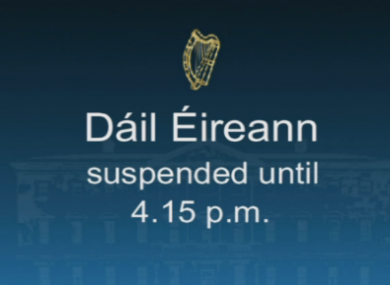 The row had began at around 3:45pm, when the Dáil was due to hold its first session of discussions under the new time allotted for ‘topical issues’. The Ceann Comhairle said he was to summon a meeting of an Oireachtas committee to provide guidance on how the new sessions should be carried out, but Halligan complained that Barrett’s interpretation was not allowing for discussion as had been intended. Barrett ordered Halligan to resume his seat but the Waterford TD refused to do so, prompting the Ceann Comhairle to call a vote on ejecting Halligan from the chamber. Business was held up for ten minutes while members convened to vote. The motion was eventually passed by an overwhelming majority, supported by the two government parties – but Halligan still refused to leave the chamber, prompting a 10-minute suspension of proceedings. Halligan is the fourth member of the Dáil to have been ejected from the chamber since the new Dáil assembled in March: the others were Richard Boyd Barrett, Éamon Ó Cuív, and Mattie McGrath. Email “Dáil suspended over Halligan row with Ceann Comhairle”. Feedback on “Dáil suspended over Halligan row with Ceann Comhairle”.